The two Salzburg Festival Halls (Festspielhaus and Haus für Mozart) and the Felsenreitschule are the main stages for the world-famous Salzburg Festival, which attracts the rich and beautiful from all countries during summer and Easter and transforms Salzburg into "the stage of the World". The Festspielhäuser are in the "Hofstallgasse" lane just next to the Franziskanerkirche and the Kollegienkirche; the name of the street means "Court Stable lane" and refers to the original purpose of the site - it hosted the stables of the Prince Archbishop. The buildings were erected in 1606 and 1607 on order by Prince Archbishop Wolf Dietrich von Raitenau to accommodate 130 horses. Under the reign of Prince Archbishop Guidobald Thun they were extended in 1662. Prince Archbishop Johann Ernst Thun ordered the construction of a summer riding academy and got Fischer von Erlach to re-decorate the façade of the buildings. In the 19th and early 20th century, they remained stables and were used by the Austrian military. The first time that they were used for staging productions of the - then new - Salzburg Festival was in 1925, when some 19th century extensions were re-modelled to meet the new dramatic needs. The festival hall was designed by Eduard Hütter, it was extended in 1926 and more extensively in 1937 and 1938 according to plans by Clemens Holzmeister. When the second, bigger "Große Festspielhaus" was built between 1956 and 1960, Holzmeister did the plans for this building, too. Formally, the site hosted the "Haus der Natur" natural history museum, which moved then to the former Ursulinenkloster nunnery a few blocks down towards the river. In 1968 a roof for the Baroque Felsenreitschule was added, once again planned by Clemens Holzmeister. The Small Festival Hall (Kleines Festspielhaus) was built in 1925. The entrance hall is decorated with frescos by Anton Faistauer from 1926. They depict Salzburg Province′s governor Franz Rehrl (a legendary figure in Salzburg′s 20th century history), Clemens Holzmeister and the construction staff at work; the "Jedermann" table round; "the power of music and beauty"; "the way of man from birth to death"; "St. Caecilia and Saints" and finally "Mysterial Play". In December, the "Salzburger Adventsingen" is staged in the Small Festival Hall alongside with other events. The frescos were removed in 1939 as they were considered as "entartet" (non-artistic, a term used by Nazi art ideologists to classify most of non-realist artworks). In 1956 they were installed again in their original positions. In the central hall of the Small Festival Hall you will find several pieces of artwork, including a goblin by Oskar Kokoschka and an Orpheus statue by Alfred Hrdlicka as well as a wall carpet depicting Kain and Abel by A. Kolnig from 1926. In 2006, the building was re-modelled extensively and re-named into "Haus für Mozart". The Felsenreitschule consists of little niches and arcades that were cut into the walls of the Mönchsberg mountain. The original design is based on the plans by Fischer von Erlach and were built in 1693. Since 1926, Max Reinhardt (somewhat the Mr. Salzburg Festival) used the Felsenreitschule for staging plays, most famously the "Magic flute" and "Faust" with a "Faust city" scenery built by Clemens Holzmeister. Note our seperate article on the Felsenreitschule. The building featured as festival venue in "The Sound of Music". In the entrance hall of the Great Festival Hall, built between 1956 and 1960, you can see the marble statues "Theater" and "Music" by Wander Bertoni. On the wall you see the "12 Ton Fries", an installation and homage to Anton von Webern. 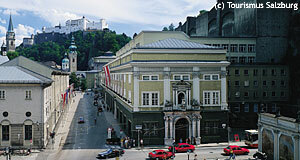 The Great Festival Hall is used only for the Salzburg Festival itself and for the Osterfestspiele, the Easter Festival. In the first floor you will find wall carpets by Oskar Kokoschka and busts of famous festival folks, such as Alexander Moissi, Bruno Walter or Karl Böhm. You might have noticed that "famous" is a very relative term in this case. The Great Festival Hall is definitely a big one - it can host up to 2170 people and is used mostly for concerts and opera, as well as the "Jedermann" if the weather doesn′t allow to show the play on the Domplatz. .